The slapped cheek syndrome, also referred to as “fifth disease”, is a viral infection that is most prevalent in kids. It is, however, not restricted to kids and can affect people of any age. This condition is caused by the human parvovirus B19 virus, which is spread by coming into contact with someone who is infected or from a mother to their unborn baby. The condition normally affects kids between the ages of 6 to 10. It usually occurs during early spring and late winter. 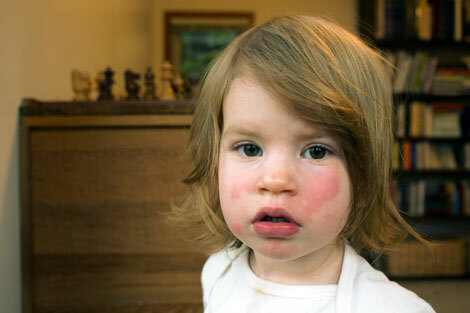 About 75% of children with the syndrome develop a red rash on both cheeks. This rash is normally visible in bright sunlight. It fades in about 2 to 4 days. In about 4 days into the appearance of slapped cheek syndrome, a light pink rash appears on the stomach, chest, thighs and arms. The rash usually has a lace like appearance and is uncomfortable and itchy. At this stage, your child is no longer contagious and can go back to school without risking infecting other people. The rash should clear in a few days. In some cases, the rash continues to fade and then reappears for a few weeks after the infection has passed. This is usually caused by exercise, anxiety or stress. Who Are at Higher Risk for Slapped Cheek Syndrome? Those with a weakened immune system can easily develop chronic and severe anemia along with slapped cheek disease. This is especially so for people with HIV/AIDs, and those receiving treatment for cancer and severe asthma. They may need blood transfusion in order to maintain the required levels of hemoglobin. Those suffering from conditions such as thalassaemia, hereditary spherocytosis and sickle cell anemia can have a sudden drop in their levels of hemoglobin if they develop slapped cheek syndrome. In extreme cases, this condition can cause heart failure, and blood transfusion may be required. A majority of pregnant women are immune to the virus that causes this syndrome. For this reason, they might not be adversely affected by it if infected. However, the disease can sometimes harm the fetus. If infection occurs before the 20th week of pregnancy, the chances of miscarriage increase dramatically. Seek medical advice if you develop a rash during pregnancy or happen to come into contact with a person with a rash. In most cases, the doctor will take a blood test to determine if you have had slapped cheek syndrome before. If so, you can relax and need no further testing. If that’s not the case, then you will need further tests to confirm the absence or presence of the disease. What Can I Do to Treat Slapped Cheek Syndrome? Painkillers – Ibuprofen and paracetamol can be used to relieve headache, fever and joint pain. Kids under the age of 16 shouldn’t take aspirin. Antihistamines – they can be used to treat symptoms such as itchy skin. They are not recommended for children below the age of 2. Emollient – moisturizing lotion is another way to soothe the itchy skin. Rest and Fluids – get plenty of rest and drink lots of water can help you ease sore throat and fever. Non-Steroidal Anti-Inflammatory Drugs (NSAIDs) – NSAIDs can be used to treat joint pain in adults. Can It Be Something Else Other Than Slapped Cheek Syndrome? If you child records temperatures of 39°C and higher, then they might not be suffering from this disease.Consult your doctor if you are not sure. If the child develops a cold followed by red spots on their ears and neck (as opposed to large red patches) which then spread to the rest of the body, they might be suffering from measles.